Instead of relating an inspirational story to perk you up as I quite often do in my posts, I’m going to do one better in this piece by telling you about a living real-life example of someone who is to me “inspiration personified”! A man so fired up and passionate about what he is does, his aura resonates naturally and magnanimously across to the people he comes into contact with. And he does it by simply swinging an exercise implement called a Kettlebell. I stumbled upon David Devito almost by accident. While visiting my parents during Chinese New Year, I noticed my cousin Owen drinking ice green tea instead of his regular alcoholic tipple. When I commented on how fit he looked, he poured onto me almost immediately a perfect spiel about an alien-sounding exercise training regime he had been on called “KettlebellHIT”. After lifting his shirt and showing me a semblance of six-pack abs that were starting to take shape and form, I urged him to tell me more. 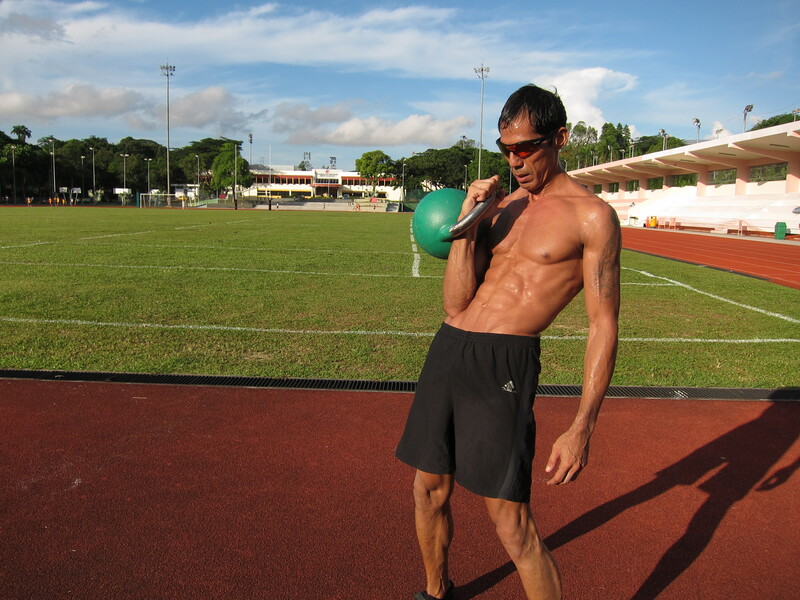 David Devito & his Kettlebell bod! This was when he mentioned David and asked me to check out the “KelttlebellHIT” website. I took a peek, it looked interesting. 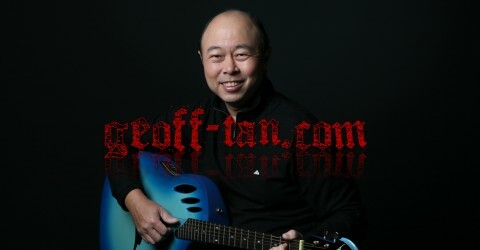 After being coerced into joining him the next week for a free introductory lesson, I went home that evening determined to find out more about this new phenomenon that had apparently taken Singapore by storm, and how this new form of workout had transformed my cousin from flab to fab. Wikipedia defines the “Kettlebell”, which is Russian by origin, as a cast iron weight resembling a cannonball with a handle, used to perform ballistic exercises that combine cardiovascular, strength, and flexibility training. And because the centre of mass is extended beyond the hand, it allows for a variety of swinging movements that helps strengthens the “core” which is basically the mid-portion of your body. Theory said and done, I signed up for my introductory lesson which was held at a small gym facility fondly nicknamed The Playground, and was totally blown away! My idea of a “Devito” until then had Danny as his first name and is an American actor and comedian who I best remember as The Penguin, a deformed sociopath, in Batman Returns. David “Kettlebell” Devito, albeit with the same last name, couldn’t be more different as compared to his Hollywood “surname” counterpart! The “Devito” I knew from the movies I watched had always looked frightfully obese and scarily unfit. The “Devito” whom I recently met ranked the total opposite – with single-digit body fat content, an endorphin-infused positive countenance, and a set of six-pack abs to die for! To me, this 46-year old is indeed a shining example of the potential someone in this particular age category can look like and become. I discovered when chatting with him that instead of just resolving to be a gym owner contented only in the bottom-line, David has a real interest in helping people get fit and strong. He is a fitness evangelist who is genuinely concerned about the progress you make at a pace that does not discourage you to continue your journey towards achieving your prime physical self. 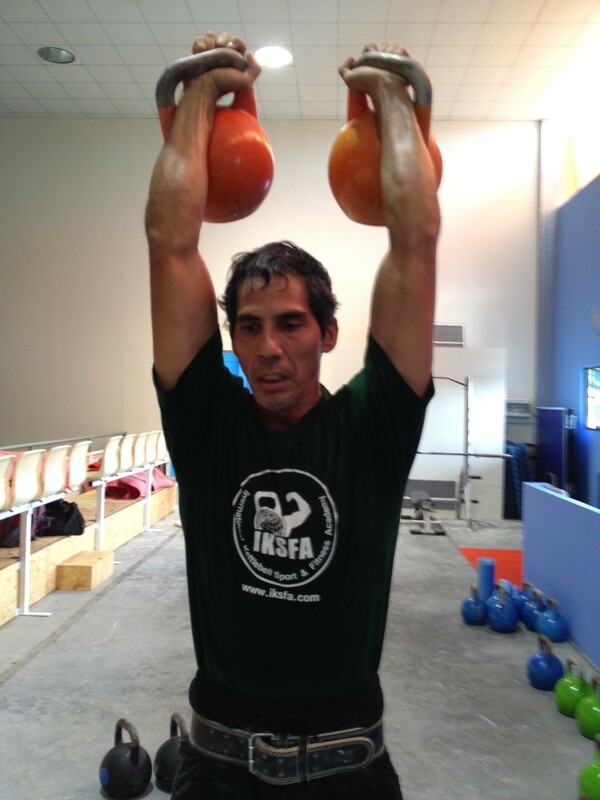 Asia's best Kettlebeller David Devito in action! I’m now a regular at the KettlebellHIT gym partaking in their strength and conditioning classes two to three times a week. It’s a bit of a family affair as I workout alongside my cousins Owen and Richard. I’ve made many new friends at this place which I call my “second home”. 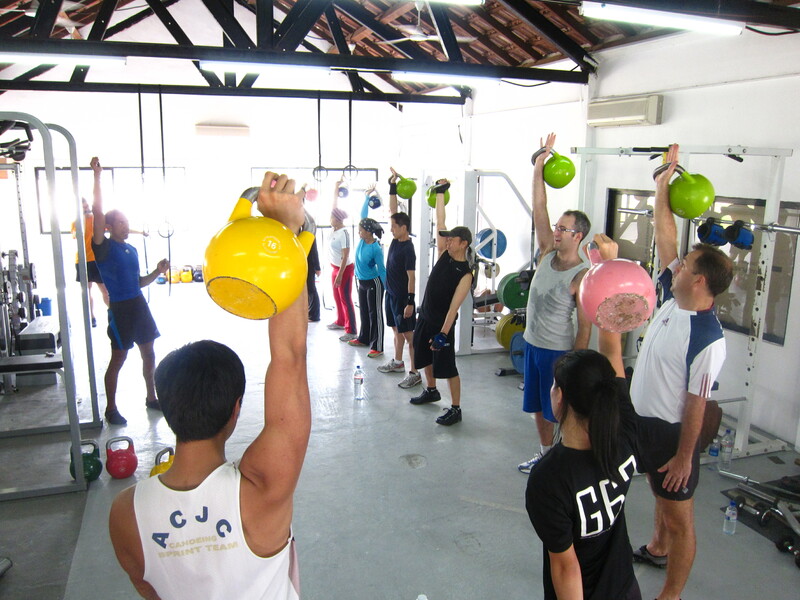 I’ve brought my clients and colleagues to try out Kettlebells and many have become converts. I started with a pink 8kg Kettlebell and in less than three months I graduated to a 16kg yellow baby. Now I’m up to working with a 24! For this I owe it all to the effective application of “The Devito Principle”. 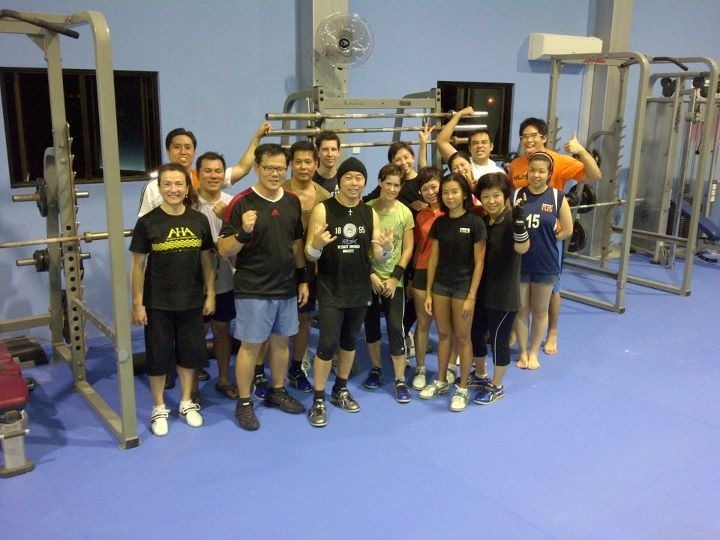 The joyous faces after a torturous workout! My friends @ The Playground. I’m inspired and I know you will be too. Check out KettlebellHIT on facebook, then come on down and have a go at Kettlebells. I look forward to having a “swinging” time with you!